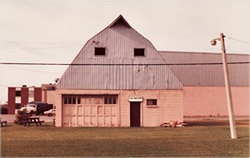 G. W. Anglin Manufacturing occupied a rented barn in Windsor, Ontario to service the machine tool industry through design, fabrication, and installation of safety equipment. CNC punching and plasma arc machines were purchased to diversify and grow the business which created a marked increase in production volumes. G. W. Anglin expanded by fabricating and installing service equipment for vehicles in the telecommunications and utilities industries. 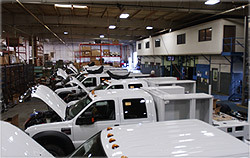 Development of manufacturing capabilities requires the addition of 10,000 square foot to a 15,000 square foot facility. Manufacturing software package including Profit Key, and CAD systems, was implemented to control production, processes, and costs. 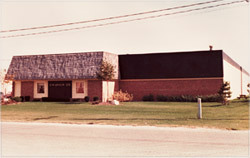 To support the rapidly increasing customer base, GWA continued to add modern equipment, and valued employees. G.W. Anglin received ISO 9002/QS 9000 accreditations through KPMG to remain on the forefront of manufacturing and technological change. G.W. Anglin moved to 50,000 square foot state-of-the-art manufacturing facility to secure the position of excellence into the new millennium. G.W. Anglin automated its Windsor Manufacturing site by integrating robotics throughout to facilitate "lights out" operation, further reducing operations costs. G.W. Anglin expanded into the GTA market by leasing a 20,000 square foot facility in Oakville Ontario. To better serve it's fleet customers. G.W. Anglin began supplying product to the heavy vehicle construction equipment market through contracts with Fortune 500 companies. G.W. Anglin further expanded its manufacturing capacity by opening a 25,000 square foot van and truck installation facility in Mississauga, Ontario. Worktrucks Plus, a retail division of GWA, is launched to provide customers all over North America with ready-to-use van and truck equipment. G.W. Anglin purchased a 44,000 square foot facility located at 1180 Aerowood Drive in Mississauga, Ontario where Hwy#401, 403 & 410 interchange and just minutes to Pearson International Airport.